It seems like months since I've published a blog post, but my calendar says that my Tuscan Villa Grand Finale was published only six weeks ago! I had planned to take a somewhat short break from miniature construction before starting my next project, but the break felt a lot better than I thought it would, so I've managed to drag it on and on. I've accomplished a multitude of things that have nothing to do with miniatures, and that felt good too. But now I have that itchy tingle in my fingers and the distractions in my mind that tell me it's time to start shrinking my world again. I've known for a long time that my next miniature build would be a Nebraska Sod House. Actually, I started building a soddy more than twenty years ago but became overwhelmed at creating the sod blocks - and overwhelmed at the amount of work space that I would need to create them. I set that project aside and moved on, but I never entirely gave up the idea. Now I have a simpler construction plan and more work space - so the sod house is an idea whose time has come. Although I know that I'm going to build a sod house, I haven't yet decided exactly how I'm going to go about building it. 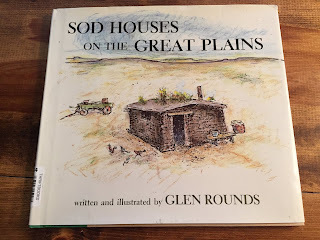 I've done much research, and the finished sod house is held firmly in my mind. But I'm experimenting to find the right materials to use for the construction, so this post is just to introduce my intentions and show my exploration into possibilities and probabilities. This tiny sod house in Nebraska is a long way and a far cry from the Tuscan villa that I just finished! The soddy is located at the Sod House Museum in Gothenburg, Nebraska. This sod house has been here for a long time; mine won't be quite so settled and worn - but old dirt is still old dirt! I like the cactus cluster growing on the roof. The setting here is a bit more lush than the "treeless plains" that would have originally and realistically surrounded the house. This bison is a full-size wire sculpture at the museum. The roaming buffalo are gone - but the memory of their majesty lives on. These are my research tools; I've had most of the books for twenty-plus years, but a few are recent additions. I bought this book to research my first attempt at building a sod house; it's still the most instructive and informative of the lot and makes me want to build a Real Life soddy along with the miniature version! 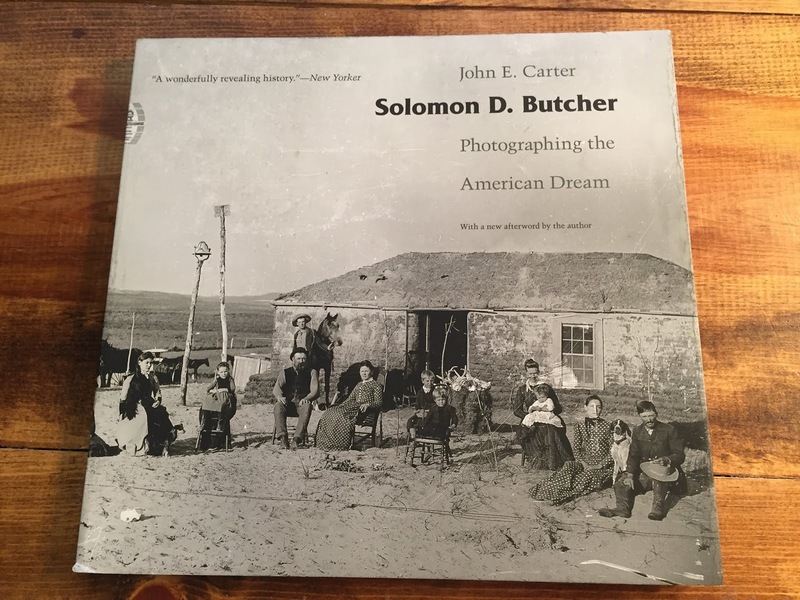 Solomon D. Butcher traveled extensively in Nebraska, photographing homesteaders during the 1880s and 1890s. 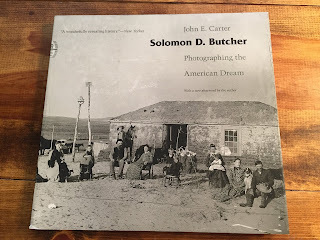 His photographs are an inspiration and make Nebraska pioneering history come alive. Another informative favorite, filled with soddy construction techniques and humorous illustrations. Prairie sod, or "Nebraska Marble," was used out of desperation as a last-ditch building material by homesteaders on the Nebraska plains, where trees or stones were rarely to be found. Sort of the way I use styrofoam as a last-ditch material because even though wood is plentiful in Lincoln, it requires more skill than I possess. So styrofoam will be the building material of choice for my soddy's core construction. To give texture to the "sod" blocks that I need, I've looked at several options. The texture of cardboard egg cartons may not be pronounced enough, but I found that wine crate packaging is sturdy and well textured, as are cardboard drink holders. The drink holders, however, don't have much usable surface - which is a drawback to the egg cartons as well. If I use the textured cardboard, I'll construct the walls from styrofoam and glue on strips of cardboard to resemble sod blocks. 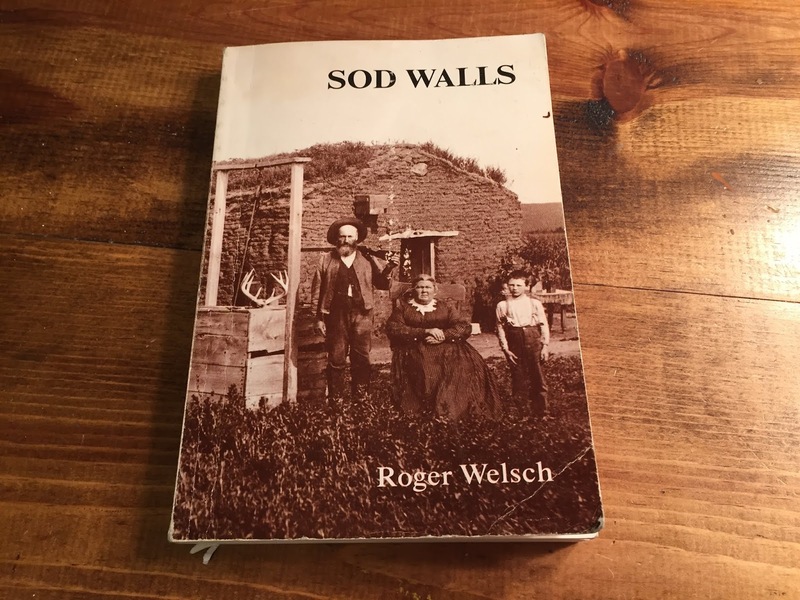 In the construction of a sod house, the blocks were laid in double rows to make the walls approximately 2 to 3 feet thick. This is probably the optimal material, and I hope to use it for the sod blocks instead of the textured cardboard. I was so excited to find it that I didn't pay attention to what the product is called or what it's supposed to be used for. But I do know that it's a rubber-like material that's as tough (almost) as nails. I couldn't cut it with a knife, so I'll need to use a saw with a thin blade. This mystery material is the right thickness - sod blocks were 4" to 6" thick. They were cut 12" to 18" wide and 36" long and laid in the same way as bricks. Each sod block weighed about 50 pounds, so building a sod house was no easy task! But I especially like the texture of this material and the easy-to-handle strips that are 5 feet long and 4 inches wide. I have to experiment with painting the strips to achieve a taupe/gray/tan variation in color. 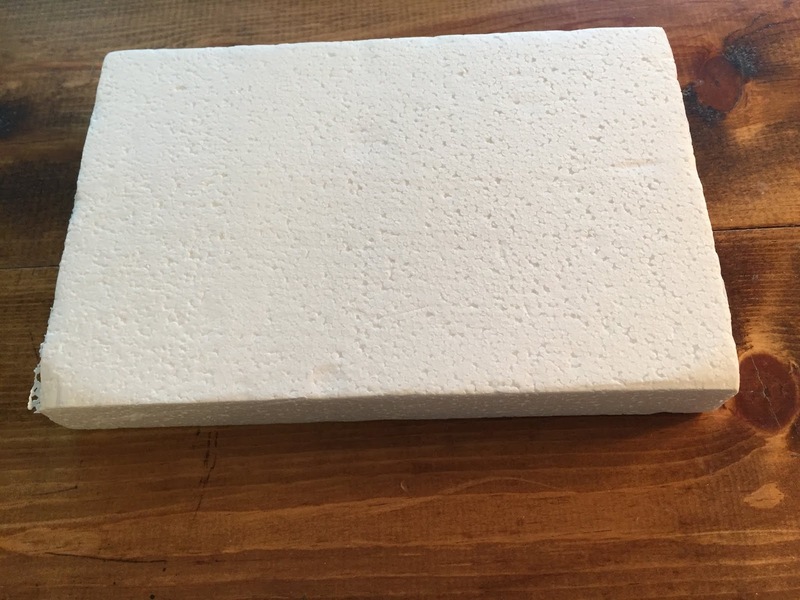 If I use this material, I'll erect inner walls using styrofoam sheets, then lay blocks of this material as the outer sod block wall, rather than cut the hundreds of extra blocks for the inner wall. I've also found several variations of prairie "grass" that will be glued to each sod block. I can, of course, try to use real dried grass, but so far I've seen only green grass, and I'd have to wait for it to dry and change color. 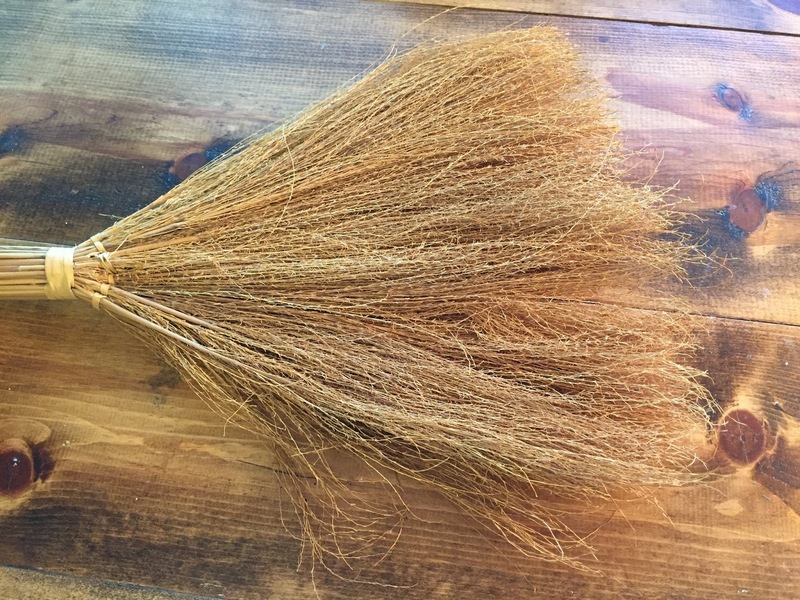 This broom was in my stash and looks similar to dried grass, but it might not be flexible enough. When it's cut into very short lengths, it's likely to stick straight out instead of bending. That may be true of real grass as well. 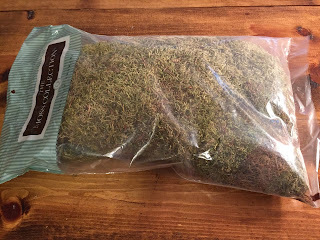 This bag of vari-colored dried moss from Hobby Lobby has potential, but it may be too "curly" to replicate wild prairie grass. 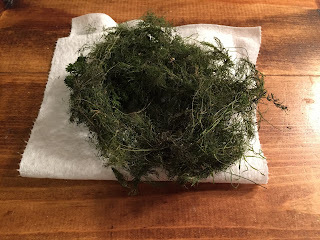 I picked up this bunch of something like seaweed from the shore of the lake where Robert was kayaking. It's too green, but I'm waiting to see whether it will turn a nice golden brown. This is probably the perfect material to replicate the prairie grass that I need. I discovered it by accident when Robert bought some ears of corn at the store. 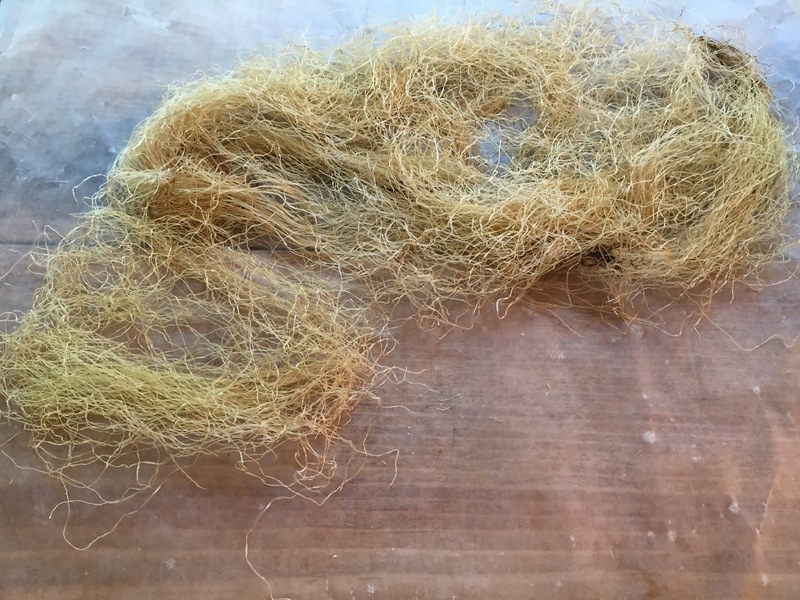 Corn silk! Golden, light weight, flexible, easy to come by. I just have to let it dry out thoroughly. If it works as a grass substitute, we're going to be eating lots of corn for a while! I've come this far in my plans for the sod house, but the experimental phase will last a while longer. Then there's a floor plan to draw up; that won't be a demanding job, since there will be only one room in the soddy! But I will need to decide on the size, which I think will measure 14 by 16 inches on the inside, with a 20 by 22 inch exterior size. I'm still working on that decision, which must be made before I can cut and prepare the base board for the house. I'll also need to decide on the door, window, and chimney placement. This house will be the first that I've built that will be open in the back, thus making it possible - at last! - to have a front door and front windows. The completed soddy has a place reserved for it in our Nebraska Sandhills home, and it will rest on a centrally-located table, which will allow it to be viewed from all sides. I'm excited about that! I'm also excited to get started with the actual construction of this soddy, but I'm going to patiently plod along with the preliminary steps. I'll be back when I have some actual progress to show! I hope you're enjoying your summer - I'm wishing you a long and lazy one. looks like a fun project - I am looking forward to seeing what you come up with! Hi, Troy - I'm looking forward to seeing what I come up with, too! There are so many different ways of building this soddy, and so many options for what to build it out of, that it's going to be mostly a process of eliminating what won't work - but first I have to try out all those possibilities - YIKES. But I know that it'll be lots of fun, and I can't wait to begin! Thanks for stopping by. I love that you have had this project in your mind and heart for so so long and are how going to set out creating it. I was the same with my fairy tree stump house which will always be my favourite miniature home because it is something I had in my mind since childhood. It seems like you have LOADS of research to draw on and are already gathering materials. This is far from just an idea in your head now Marjorie - it is already underway. The fact that it will be smaller than the Tuscan Villa should help you a little but you still have a big task in front of you. I look forward to reading your progress and seeing the little sod house emerge. Best of luck and I am glad you took a break between projects to recharge your batteries. Sounds like you will need them fully charged for this one! Hi, Carol - I always enjoy reading your comments; we seem to have such similar thoughts on many things. I appreciate that you can relate to my holding on to the soddy "dream" all these years. There are so many plans to make and details to work out that I'm sure it'll be awhile before I begin the actual construction - but I'm already having fun and anticipate having lots more. It's going to feel a bit strange working on such a small house after the big villa, but it will be interesting to see what new and different challenges it presents. I am glad that I have lots of "How-To" books to keep me on the right path! What an amazing idea to replicate such a wonderful and significant part of Nebraska's history in miniature! I bet doing all the research all these years has been fascinating! What a neat structure! And to already have a designated and prominent place for the sod house in your vacation home is wonderful! What a conversation piece it is going to be. I am excited for you as you begin this new and sure to be exciting journey, and so happy to be able to follow it. The materials sound very intriguing, and it'll be so interesting to see what happens with the seaweed stuff. I love the idea, Marjorie, and can't wait to see it come alive! Hi, Jodi - Thank you for your enthusiasm for my sod house construction! The research has been a fascinating phase; story after story of incredible hardship and hard work. Those early homesteaders were a tough and brave bunch, and I feel as though I'm already immersed in their lives and their history. Working out the details for materials and for the construction process is proving to be interesting; I wasn't expecting to be presented with so many options so early on! So far the seaweed stuff is retaining its original dark green color. I'll likely set it aside for a different purpose somewhere - so the corn silk is still leading the pack for prairie grass. I'm happy that you'll be following along on this project and sharing my excitement! Hi, Rosa Maria - I'm happy to know that you like the little sod house. It's a good representation of the typical Nebraska soddy, and I just hope that my miniature one will turn out the way I envision it. The sod house will be much smaller than my other miniature houses, but I think the construction process will be just as interesting. I'm still making decisions on which materials will work best for the results that I need, but I hope soon to be able to start the actual construction. I'm trying to be patient! Thank you for stopping by! Hi, Betsy - Thanks for stopping by to review my plans for the sod house. The plan making is still underway. These preliminaries seem to be taking a long time for such a small structure! (Maybe because I've become so engrossed in all the pioneer and sod house books that I've been reading.) It's going to be an interesting project, if I can just get going on it instead of reading about it! Hello, Maria - I'm glad that you'll be following along as I begin this new project; I'm excited to get it underway. Thanks for stopping by! Yay!!!! You're back blogging and I love your newest idea of a sod house! How awesome! I can't wait! It'll be so exciting to watch your progress! Corn silk is a great idea for grass: I hope it dries out enough...perhaps a few minutes in a 200 degree oven would help them along? If you're putting cacti on your roof, but a mini succulent plant from home depot or Lowes and snap off some branches/leaves and dry them. Maybe brush some matte poly on them? Instant mini cacti. I'm so excited to follow along!!! Super happy right now! 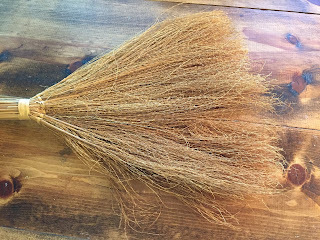 Hi, Lori - I appreciate your enthusiasm for my next project, and I also appreciate the great tip for drying the corn silk. I'm so excited to try your method; I'm hoping that the oven heat will also darken the corn silk as it dries. Actually, I can pick up mini cacti from our yard at our Sandhills home - the plants and grasses there are all "native," which means that there are only various kinds of weeds, thistles, and sharp bristly things. But I love your suggestion to dry the cacti and apply the matte poly - that should work to perfection. Now I just have to be patient - planting the cacti on the roof will be about the last thing that I'll need to do on the soddy. I'm not making much progress so far - this summer has been so busy with various things, including grandchildren. School starts in a couple of weeks, so I plan to move ahead at full speed on the sod house after that. I'm so glad that you'll be following along! What a wonderful project! I had never heard of sod houses before and I think they will make an incredible miniature project. I love the research phase and it looks like you have great reference material. 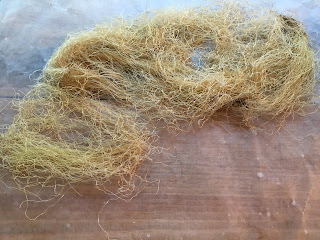 I am very curious to see what material you use for the sod blocks, and I love the idea of using corn silk. Knowing how talented you are, I am confident that this will be another incredible project. Yay! A new Marjorie adventure to follow! Hello, Giac - and thank you for leaving such an encouraging comment. I've enjoyed all the reading that I've done in preparation for this project. The sod houses have a lively and interesting history. 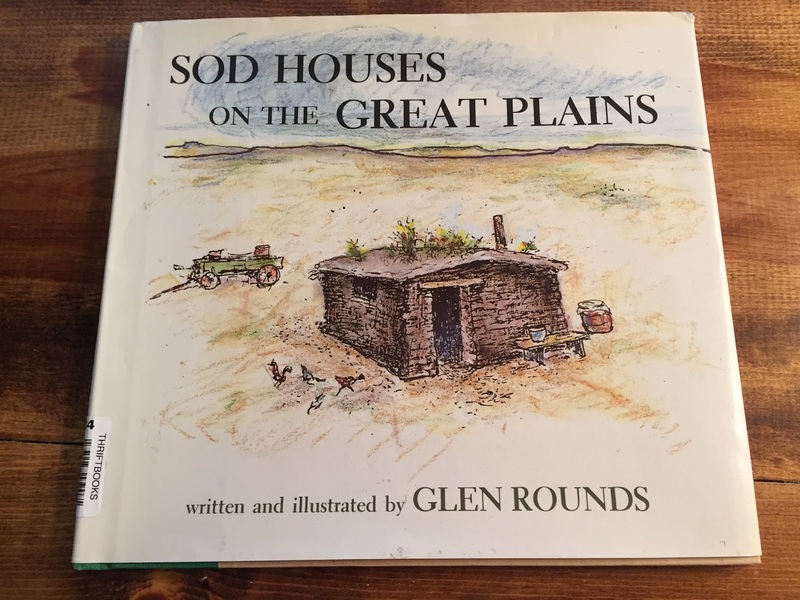 Robert and I have also taken a few road trips to see the very few remaining sod houses in Nebraska - and a couple of newer replicas. There were many drawbacks to living in a soddy - but if I had a chance, I'd be more than willing to give it a try! I am also very curious, as you are, to see what material I'll use for the sod blocks! I still haven't decided for certain, although I'm close to making that decision. I'm very happy to know that you'll be following along on my new adventure.